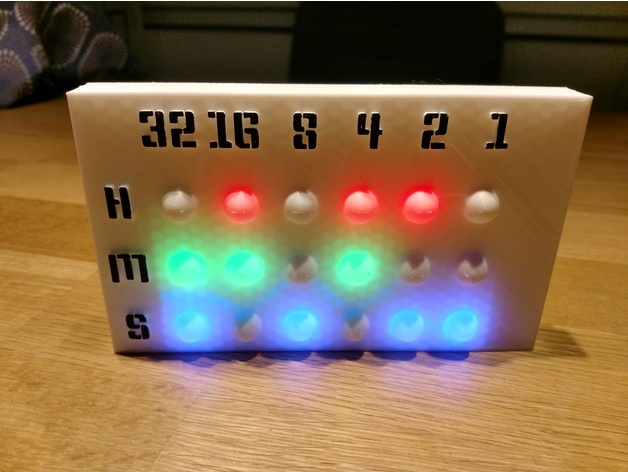 Binary Led Clock (24h) #3DPrinting #3DThursday « Adafruit Industries – Makers, hackers, artists, designers and engineers! Angel3D shared this project on Thingiverse! This is a next 3d printed case for a led clock, this version is a binary led clock. I admire the many creations which can be found in the net, and was inspired to create a own one. Where my other led clock was created in sketchup, this one I fully designed in openSCAD to understand an learn about the tool. I was surprised how fast I could create first results. I hope people can find pleasure on it. I am still working on a case for the nodemcu (esp8266). Did not yet finish it.